Raven's Threshold Ramp is ideal for reducing tripping hazards, adding slip resistance and meeting access and mobility gradient 1:8. 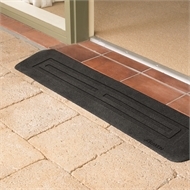 Quick and easy installation means the Raven Threshold Ramp is a cost effective solution to your home access issues. Available in 25mm and 50mm thicknesses.